To see the full bilingual interactive map, visit WilsonCenter.org. In southwestern China, three parallel rivers – the Nu, Lancang, and Jinsha (also known as the Upper Mekong, Salween, and Yangtze, respectively) – form a series of corridors that connect the tropical rainforests of Southeast Asia to the Tibetan Plateau. These areas are some of the most biodiverse in the world, and scientists argue they have value as “climate refugia” – places worth preserving in order to allow species to retreat to cooler, more suitable climates as temperatures rise. A cascade of dams, however, has been planned for the region, threatening to submerge habitats, reduce the flow of tributary rivers, and make the area less suitable for many plant and animal species. In December 2013, a group of Chinese environmental NGOs released a comprehensive assessment of China’s rivers and the lessons from past unchecked hydropower development (read the English executive summary here). They advocate for an urgent determination of ecological “red lines” for rivers, ambitious promotion of other forms of renewable energy, and a major push for ecological conservation legislation. An English-Mandarin interactive map published by the Wilson Center’s China Environment Forum illustrates the scale – and potential costs – of this hydropower build-up. 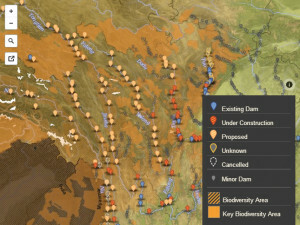 It highlights more than 90 major dams (22 in operation, 48 planned, and 23 under construction) that overlap with areas Conservational International identifies as biodiversity hotspots in southwest China, a trend that could damage fragile local ecosystems. Climate Mitigation at What Price? When it comes to climate change, China presents a conundrum. It is the world’s largest greenhouse gas emitter and consumes nearly as much coal as the rest of the world combined. But China also boasts the largest installed hydropower, wind, and the fastest growing solar capacity in the world – and it’s looking to expand. The central government is taking climate change seriously, as seen in its plans to increase the share of non-fossil energy to 11.4 percent of total energy consumption through an additional 160 gigawatts of installed hydropower capacity by 2015, along with ambitious expansions in renewables and nuclear. By 2020, China plans to have 430 gigawatts of installed hydropower capacity, more than Europe and the United States combined. The ramp up of non-fossil energy has gained particular urgency in the face of worsening smog problems over cities in northern China. But many of the existing, planned, and under construction dams in China’s southwest lack comprehensive environmental and social impact assessments to fully evaluate their true costs and benefits. Undervaluing ecosystems and their services has resulted in the prioritization of carbon reduction goals while the significant ecological, social, and economic impacts of these hydropower projects are downplayed. Reductions in the diversity and overall robustness of ecosystems may negatively impact the human communities that depend on them, as well the natural. Large dams often flood highly fertile and valuable farming land, and the communities displaced from these areas face social and economic challenges after resettlement. Notably, Chinese dam developers have often failed to respond to concerns over their impacts in other Southeast Asian countries, limiting or sometimes outright refusing to share data on water and sediment that are critical for understanding how downstream riparian habitats will change. As the China’s Rivers Report shows, there are clearly concerns within China, but it remains uncertain how they will be balanced with the push to reduce greenhouse gas emissions by the government. One thing is clear: How China balances hydropower development and ecological protection in the coming years will have far-reaching consequences for sustainable development, the environment for future generations, and the wellbeing of mainland Southeast Asia as a whole. Sources: China.org.cn, China’s Rivers Report, Conservation International, The Guardian, U.S. Department of Agriculture, U.S. Energy Information Administration, World Energy Council, World Wind Energy Association, Xinhua Net.